The pop culture is evolving at a whooping velocity. The obsession with designer clothes, bags and other materialistic things is yet to get a closure and we may need to deal with another league, which is of designer dogs. Some of our readers may not be aware of them, but designer dogs are a cross between two purebred dogs. Pure breeds used in breeding designer dogs are bred over many generations without altering the true traits of the breed. Some examples of designer canines are Golden doodle (a mix of Golden retriever and poodle), Pomapoo (a mix of Pomeranian and Toy poodle), Cockapoo (a mix of cocker spaniel and poodle), etc. There has been a lot of controversy over these breeds. Some think that mixing of the breeds is making the dogs unhealthy, while some think that the designer breeds outlive the pure breeds. If you are fascinated by this concept, it may not be wise to go for it without knowing anything about it. You must know the advantages and disadvantages of designer dogs before you decide to include them in the family. 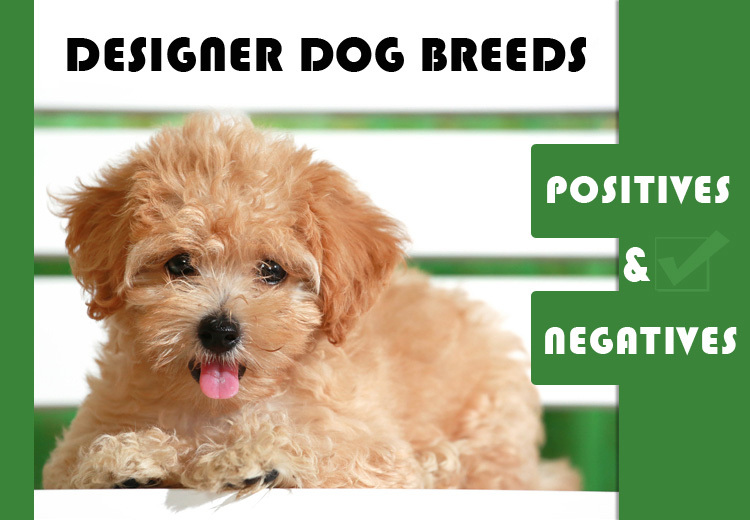 To make things easier for you, here we have listed some quick pros and cons of the designer breeds. Let’s check. The most advantageous thing about designer canines is that you may get a number of varieties. More than 200 distinct hybrid fusions exist, which suggests that you may get a pooch with specific traits that you want. Most of the hybrids are either small or medium sized with desirable traits. They have a magnetic persona with sheer cuteness. Every need could be fitted by the designer dogs. From pocket-sized pooches to low shedding could be found among them. For instance, pugs are cute, but have a short nose which makes it difficult to breathe. But Puggle, which is a mix of a Pug and a Beagle solves this problem and without ruining the cuteness of a Pug. Breeders claim that an offspring of two different pure breeds rarely inherit genetic defects. Whereas, pure breeds may carry the genetic disorders that their ancestors had, like hip problems, blindness at an old age, etc. The major disadvantage of buying a designer dog is that they can cost you hundreds of bucks. Any articulated breed will at least have a price tag of $700. Whereas, you can adopt a pure breed easily at almost nil expenditure. When two pure breeds are bred, a specific appearance and traits are expected. Though, it is not necessary that the dog will always develop the assumed traits. So, a mixed breed may not have an absolute outcome. If you adopt a pure breed, you are sure about the approximate physical characteristics and other behavioral traits through their parent’s history. So you know what you are opting for. However, in a designer breed say for instance Yorkipoo, the pup may grow into a large sized terrier while you wanted a cute poodle sized dog. So, there is no surety of the outcome. Although the breeders claim that the designer dogs have a better health than the pure ones, veterinarians disagree. This is a debatable issue and the vets claim that there are more cases of illness in hybrids when compared to the pure breeds. In all, you may need an adequate deal of research about your preferable dog breeds before you go for a designer dog. Brood on the above mentioned pros and cons of designer breeds and decide the best for yourself. « Save Extra 7% NOW- Labor Week Sale on PetCareSupplies!